Book 7: Judd, Lionel, Vicki, and Ryan have been able to hide the Underground, until now. When Vicki gets accused for writing the Underground she gets sent to a prison for bad kids and at the same time the Antichrist is signing the treaty with Israel. So Judd and Bruce go to Israel to talk to some people. Will this nightmare ever end? I thought this book was really good because they finally got caught for writing the newspaper the Underground. Also they finally get to the good part of the series, one of the most important parts of the whole series. The Antichrist signs the treaty with Israel (and other people for example, the president of the u.s) that starts the seven years of tribulation. If you are a person who likes to read realistic fiction, religious books then I recommend you read this book. I want to make a distinction here. All 7-11 earned five stars, but twelve did not. Chancing that this'll be a spoiler: I can't stand it when main characters die. Especially my favorite main character. I don't like it. I know the future will be bleak for all those left behind, but I simmply don't read books to become depressed. Finished 7 through 11 but still working on twelve these books are very strong in literature so I suggest reading them carefully they have hidden clues inside the books and if you don't like drama books don't get it but still it's a good book and if we're not with Christ you will be left behind !!!!!!! I think it's interesting how these books align and intertwine with the adult series. I can't tell though what age they would be best for. Most of my students read the original series and the content is too extreme for much younger kids. im going to read thease after ive read the first series note. i don't injoy reading that much so im going kindaslow. I am not a religious person, but I LOVED this series. I was never able to finish it because I couldn't find the last couple of books but I intend on finishing it at some point. Very good! I think the writing is really poor. Anyone who likes reading about the people left behind should read these. 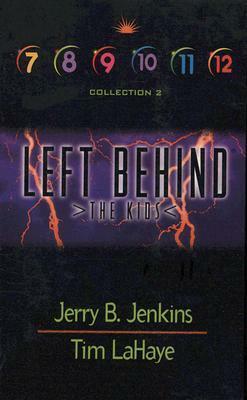 Jerry B. Jenkins Tim LaHaye - Jerry Bruce Jenkins is an American novelist and biographer. He is best known as co-author of the Left Behind series of books with Tim LaHaye. Jenkins has written over 185 books, including mysteries, historical fiction, biblical fiction, cop thrillers, international spy thrillers, and children's adventures, as well as non-fiction. His works usually feature Christians as protagonists. In 2005, Jenkins and LaHaye ranked 9th in 's 10th Anniversary list of Hall of Fame authors based on books sold at during its first 10 years. Jenkins now teaches writers to become authors here at his website. He and his wife Dianna have three sons and eight grandchildren.